Daisy is a freelance TV presenter, reporter and writer. She is an accomplished corporate facilitator and host, having hosted countless awards and moderated many conferences for a wide variety of clients – including many large multinationals, trade bodies and charities. She left ITV News to go freelance in December 2012 after a very successful seven years during which time she was their most senior female reporter, having been Chief Political Correspondent, Economics Editor and Special Correspondent. As well as reporting for ITV News she also presented their Lunchtime and Weekend News and ITV’s Moral of the Story. Before joining ITV she presented (as Daisy Sampson) for the BBC’s Daily Politics and was BBC Breakfast News’ Political Correspondent. She has also presented her own drive time show on LBC Radio and has presented Channel 4′s Powerhouse, the BBC’s Heaven and Earth Show and BBC Weekend News. She also presented TV on Trial in 2005 with John Sergeant. Daisy has appeared regularly on Have I Got News for You?, The Wright Stuff, Loose Women and Despatch Box as well as many Radio 5Live programmes. 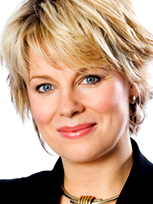 She is a familiar face on ITV’s This Morning and Daybreak as a regular news reviewer. Before moving into broadcasting in 2001 she spent a decade working in Westminster, starting off as a 19-year-old Tory researcher before writing for many newspapers from the Press Gallery, profiling MPs in The House Magazine – which she ultimately edited – as well as working for Lib Dem Leader Charles Kennedy as his Press Secretary. She was a consultant on the BBC’s A-Z of Politics and edited The Politics Companion, published by Chrysalis books. Daisy’s interests include all aspects of business and political life, parliament, social affairs, the economy and business. However, she also has a wide range of other interests which she writes about and comments on ranging from all aspects of family life and children’s issues to penal reform, dogs and horses, motorbikes, interior design, party and planning and juggling life as a busy, working Mum. Daisy supports many charities and is a patron of the St John’s Hospice and actively supports Crisis. She lives in North London with husband John McAndrew – Associate Editor at Sky News – and their two children Milly and Daniel.